Community Blog by RedHeadPeak // Should open world games rethink how they tell stories? We've all observed stories that use the 'x days later' device. A linear narrative can avoid weeks, months and years of bunkum by jumping to the next interesting bit. It's a trick which allows the storyteller to stick to the good bits, providing it is used effectively. It's a trick we can all accept and appreciate. Now imagine you were reading a book or watching a film where the inverse happened. Instead of moving time forward 'x weeks' into the future, the story instead took a detour which lasted for days or weeks, only to return to the main story as if no time had passed. In most cases, we would find that very odd and a little jarring (unless it's a dream-sequence or a peculiar plot twist). Yet open world games let this happen all the time. Now, for the benefit of all, I should state that this is not meant as a criticism. My mind is not made up concerning the question I raise today. I sometimes find storytelling odd in games, but I'm open to debate. I wish to hear your views. The discussion is this: should games which allow for freedom of exploration and procrastination have a central, linear storyline? Below are my thoughts on this topic. I invite you to peruse my brain etchings before commenting. Let's start in an obvious, popular place: Grand Theft Auto. Each game in this series has had some semblance of story steering the player's actions, but only the most recent iterations could be described as 'story-driven'. In GTA III and Vice City, the character makes steady progression through a seedy underworld, whilst the narrative winds lazily towards a fiery finale. You start out completing simple missions for low-level thugs, and then move on to move complex tasks with the criminal elite. It's deliberate disjointedness works well with the sandbox environment. There are pieces of a story that follow on from each other but rarely ask the player to imagine that all these events are close-knit. 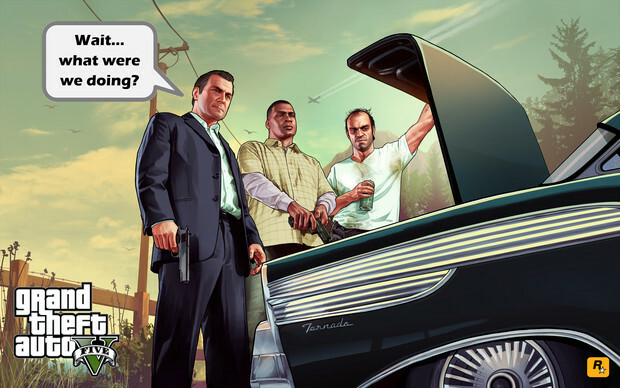 Grand Theft Auto V delivers its story in a much more linear way. All the major players become intertwined early on. The story would have us believe that the events of each mission follow on (almost) directly from one another. Whilst we may take a break from the story for random side-missions, or just plain old randomness, the story will pick up as if little time has passed. What's even stranger is that the game does a really job with its side stories. Whilst the main story is very focused, the player can also bump into a range of characters at the most unusual times and locations, leading to some memorable antics. The game tells you that the players that a vital heist is about to go down, but Michael might instead start helping the Paparazzi find a scoop. Trevor might be raging about an argument with his bank robbing buddy, but he still has time to help two old creeps assault the social elite. Unless you play the story straight through, without distraction, the focus on a rigid storyline doesn't always work. Now there is rather basic counter-argument here: it doesn't really matter how the story plays out. The Grand Theft Auto series is the epitome of the Sandbox experience, and to take the storytelling too seriously might be doing the games a disservice. Except that the story is designed to be more serious. 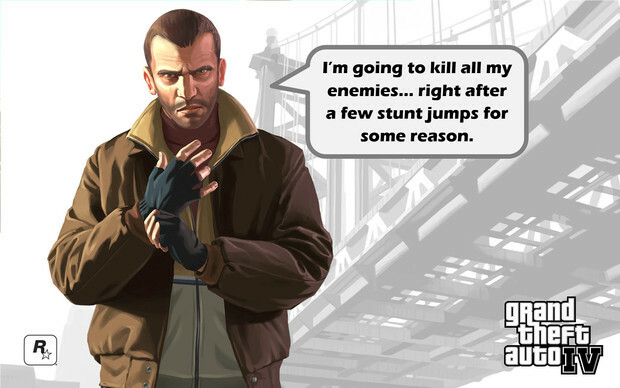 GTAs usual wackiness appears now and then, and satire is the marrow inside the bones of every game in the franchise, but both GTA V and GTA IV have taken a dip in the pool of gritty-realism. My concern is that these games intend to deliver a game with a more 'grown-up', focused narrative, without a major ingredient of this form of storytelling: pacing. The sandbox nature of the series robs the story of the effective pacing that would give the story real weight. I don't dislike the stories of the latest Grand Theft Auto games, but a 'completionist' Gamer like myself will only ever the see the story unfold in sporadic chunks. Any intended impact is lost. Another argument in favour of linear stories in GTA is that these people are criminals. Whilst their monologues may suggest a sense of urgency, we can hardly be surprised if they take the week off to shoot pigeons or play tennis with their wives for a solid week. They are unpredictable, and that's fine. In open world games where you are the saviour, procrastination between major plot points is very odd. 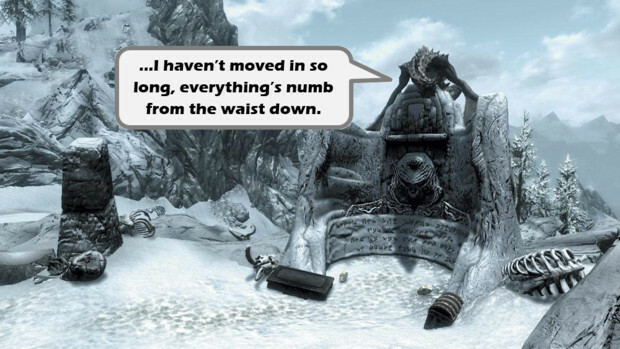 Take Skyrim for example – my favourite game to over-analyse of late. I've said many times before that the Elder Scrolls games will draw tens of hours of my attention, but I'll never actually complete the story. 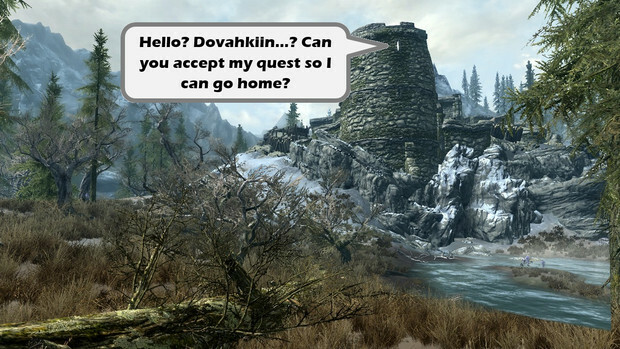 In Oblivion and Skyrim, the Kingdoms are done for. If I'm meant to be the saviour, then there is no salvation for those poor NPCs. I can't even remember if I ever finishedMorrowind (which probably means I didn't). Now I'm sure many of you did a better job on the main quests, but you would have spent copious hours not saving the world. For in-game days at a time, the quest givers sat idly by as you plunged into caves and skipped across fields. I would love for an NPC to wander past me as I've picking flowers and catching butterflies and cry in disgust, "Aren't you supposed to be fighting dragons right now? There's a dragon eating people over in the next village!" And there's the issue. The Elder Scrolls games insist on an over-arching, linear storyline whilst simultaneously sending you out into an expansive world with no repercussions for lollygagging. The fate of the world is in your hands, but the untold evil will wait until you are ready. You're going to rest against a wall for ten hours for the potion shop to open? No worries, we'll tell the apocalypse to hold fire. All sense of drama is drained for the story. You heroic deeds carry little weight. It wouldn't take much to give the amount of time passing a sense of context. Oblivion gates and dragons start appearing in the respective games once you have completed a set number of quests (which in itself is weird, and suggests the hero could save the world by doing nothing). 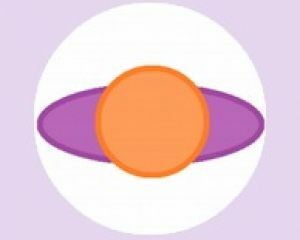 Why not have the emergence of evil occur on a time frame rather than at event-specific moments? The player could still play the game as they saw fit, but the increasing number of encounters with monsters would remind the player of what they should be doing: Gee, there's a lot of flying lizards about. I best get to killing some of them soon. And it would be nice, amongst all the NPCs that deliver the main quests, if one of them was just a teensy bit miffed that I kept them waiting for a fortnight. Just one, "Where the f*ck have you been?!" and I would feel better about the linear storyline. Some more positivity methinks. One game that I feel got the balance of linear story and open world was Infamous. Firstly, the game gave out pieces of the map in stages, and found a decent explanation for why that was happening. Secondly, and most importantly, the game used the device mentioned above: 'x days later'. After completing a set number of missions, the game would hop forward to 'day 16', skipping chunks of time and adding more context each time. It doesn't matter that you character bounces around town looking for collectible shards or divert to side jobs, because the story is clearly happening over a long time. Far Cry 3 also styles its narrative to match the gameplay, for the most part. The nature of the protagonist suits players focusing on the storyline or trying to complete. The character is lost on an island, and torn between saving his friends and embracing his inner murder-sadist-psychopath. Although, if you play the game to full completion, we are expected to believe that the protagonist's friends are the most patient people in the world ever. They will happily sit in that cave for a month, never question why they don't just leave. 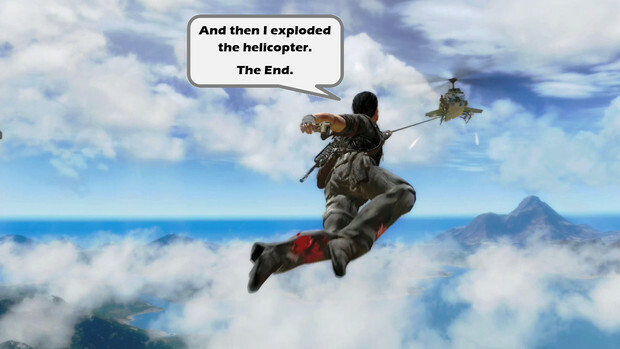 And if the effervescent Just Cause 2 has a story, behind all the mayhem, the game doesn't try too hard to make me remember it. And that's a good thing. I don't have a definitive answer to the question above, nor do I have a strong opinion either way. What I currently believe is that open world video games will put a great deal of thought into game and story, but less thought on how those two elements connect. I can still enjoy the story of a sandbox game, but I sometimes wonder if open world games could handle the story differently, or whether they have to be 'story-driven' in any way. I look forward to your thoughts on this. Have you ever wished an open world game delivered the narrative in a different way? How would you have like to see a sandbox tell the story more effectively? Are there open world games that demonstrate the best pacing and direction possible?